Today is the last day before Easter break and the work tank will be unattended until Monday. There are three adults (two males and one female, Esmeralda) and lots and lots of new babies. This tank was fed last on 3/25 and will feed again on 4/1 when I return to work. Plasma will be at least three or four days after feeding. The other female in the Blue ocean zoo was found dead, Bertha is still going strong. 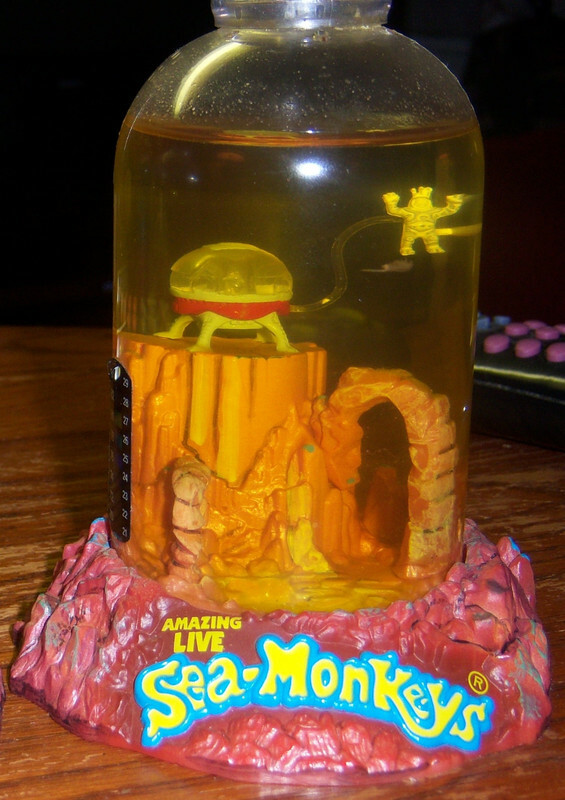 There was only one live sea-monkey in the magic castle tank. The green ocen zoo was devoid of life and the red zoo had one lone survivor. They were all transferred to the Mars tank tonight. The Mars tank was then aerated and growth food was added. 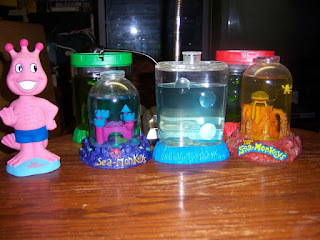 The blue ocean zoo and the magic castle tank are now set aside to allow all the water to evaporate from them. Two adult males and one adult female (Esmeralda). 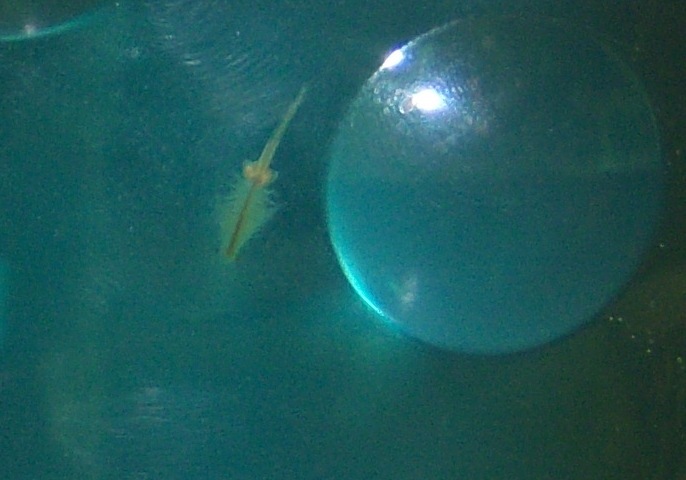 Small hatchlings are visible in the tank. Plasma III was added on March 19th. I aerated the tank and added growth food this morning when I got to work. One of the new males is mating with Esmeralda. 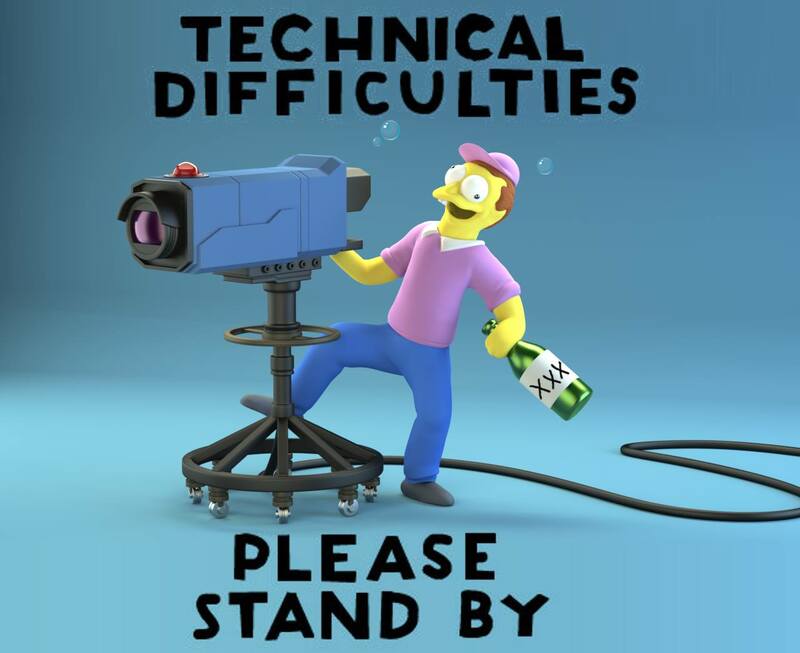 Blog.com has been offline for last 36 hours. For now the site will stay here but I am going to have to move if this keeps up. I will most likely move to wordpress but I will lose features when I do that. I am trying now to figure out how to get the blog backed up so the move will be easy. I will certainly post a link to the new site if and when I get it ready. Here are the home experiments in their new spot in the kitchen. I came in and inspected the tanks this afternoon and sadly I must report that the male sea-monkey in the blue ocean zoo has died. Bertha is still going strong and the other female appears to be OK as well. I gave the tank a dose of Sea-Medic just to be on the safe side though. I did notice some small babies swimming. I hate to do it but I may have to retire this tank soon. 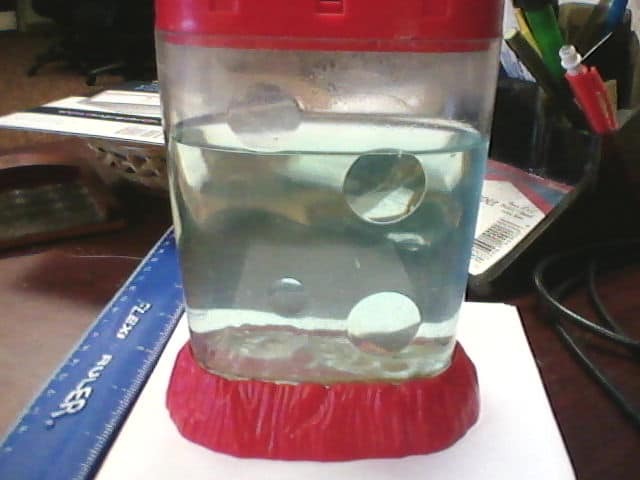 I think I will just let the water evaporate out of it if I transfer the sea-monkeys to another tank. After a week of spring break, I was anxious to see how the red Ocean Zoo at work was doing. I was relieved to find everything just fine. The work tank has three adults in it now, Esmeralda and a male and another female. They were fed this morning and I will give the tank a dose of plasma in a couple of days. Comics-Ads: Count Dante - The Deadliest Man Alive! 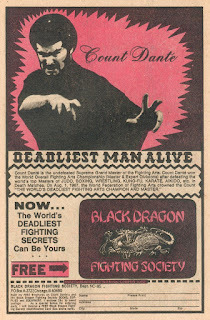 Today I am rolling out a new feature... Vintage comics ads! 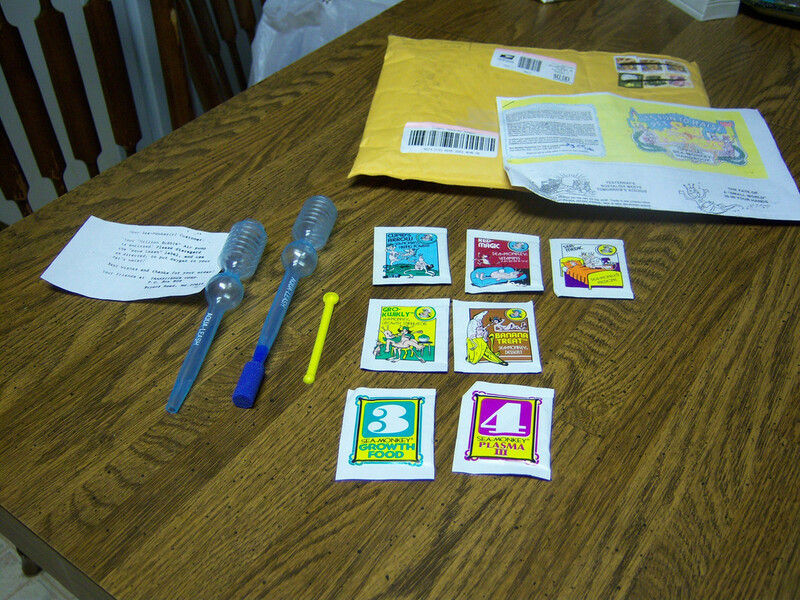 Not just of Sea-Monkeys either. These were the ads that caught our attention and imaginations back in the day... Get muscles and learn karate to beat up the bullies! Learn the secrets of hypnotism and get everything you ever wanted... such as making girls like you! Here is another video of the babies in the Mars tank! New life has erupted in the old style mars tank. I changed out the water in the old style Mars tank and transferred a female from the other mars tank over to it yesterday. Here you can see how the tank looked before and what it looks like after. I decided that the old style Mars tank needed a bit of maintenance. First of all the water was too orange and it was hard to see the Sea-Monkeys in the tank, especially any tiny babies that were in there. First I prepared a quart of water. Jumbo Plasma makes a quart of water, too bad they don't sell it any more... I am down to my last pouch! Then I used the aqua-leash to get the two males out of the tank and transferred them to a waiting Ocean Zoo. After this I poured off about 2/3 of the tank into another Ocean Zoo, then I topped off the Mars tank with clear plasma water and transferred the males back into the tank. 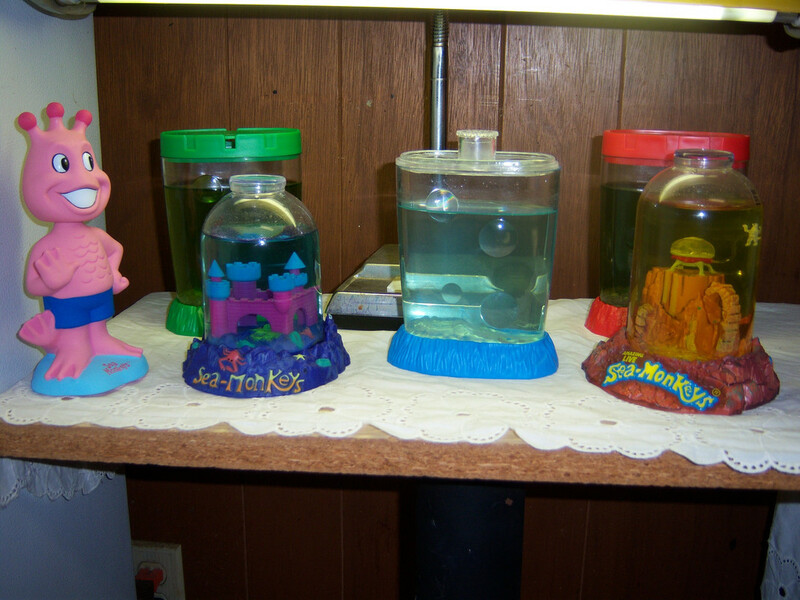 As your Sea-Monkeys age, sediment will begin to gather in the bottom of your tank -- a combination of food, algae, waste and un-hatched eggs. 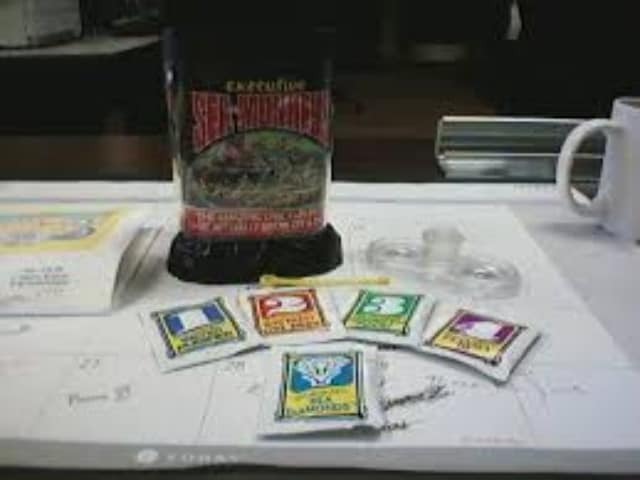 This is a natural part of the process and is not necessarily harmful to your pets. In fact, the Sea-Monkeys seem to enjoy routing around the murky basin. I choose not to clean my tanks -- rather let the process in their ecosystem continue naturally. Ocean Zoo - Now sports a binocular cover. Bertha is still going strong. I haven't seen any other Sea-Monkeys in the tank today. Fed a half small scoop of Red Magic for feeding. Also here is a sweet close-up of Bertha. Shakey stands to the side and observes. I have been searching for a nice easy loading blog theme and I think I have finally found it. I switched to Headlines by Woo Themes, it is nice and clean, easy to read and navigate, and it has a nice variety of options. Do pardon my dust as I tweak this theme in the next few days. If you have been trying to subscribe to the blog using the email subscription widget, it is fixed now and directs properly. Imagine my surprise as I was handed my mail to discover that my Transcience order had arrived. Yay! This is definitely not the commercially available kit from a couple of years ago. This kit is exclusively available from Transcience. 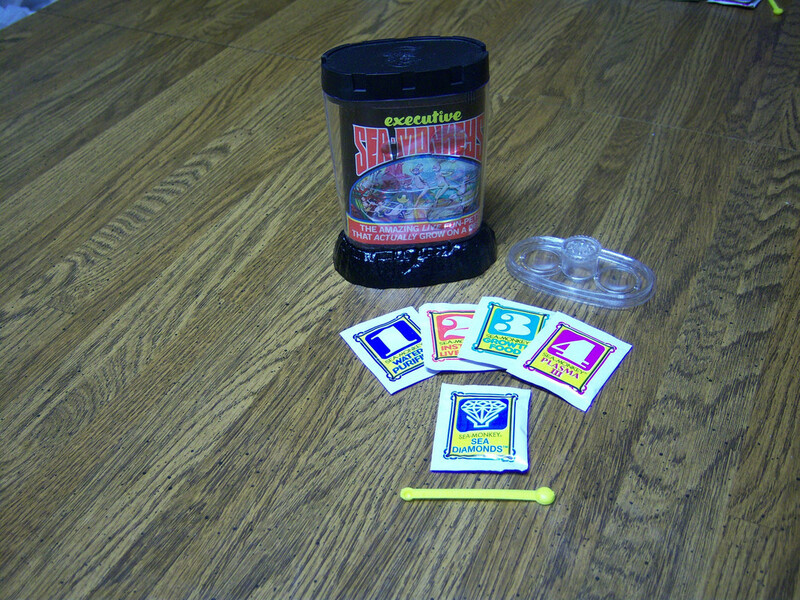 Here's what you get: A nice black old school style Ocean Zoo with Regular lid, A binocular lid, a basic kit (packets 1, 2, & 3), Plasma III, Sea-Diamonds, and a feeding spoon. To help keep your Sea-Monkeys water at a cozy 70+ degrees, pick up an aquarium thermometer from your local pet store (Wal-Mart...). These inexpensive units are a thin, smallish piece of plastic that will stick right on the OUTSIDE of your Ocean-Zoo tank and help you chart the comfort-zone within. 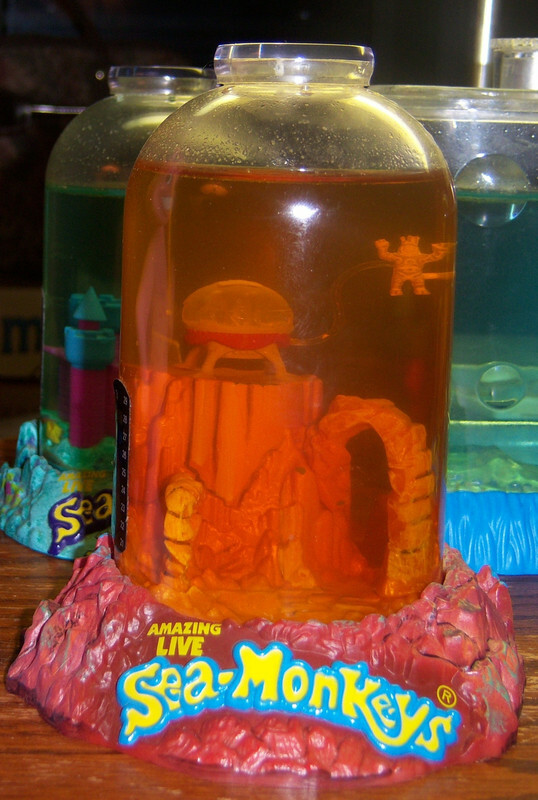 Look at all the Sea-Monkeys in the old style Magic Castle tank! Shakey thinks they are cool. 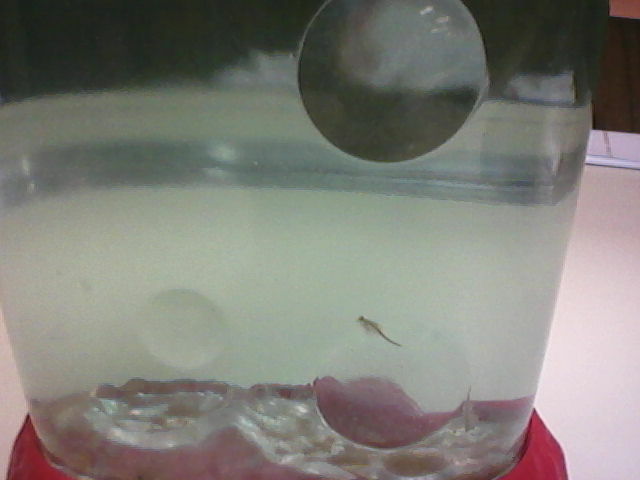 The first seven days of a Sea-Monkey's life are critical. I highly recommend aerating the tank EVERY DAY for the FIRST WEEK. 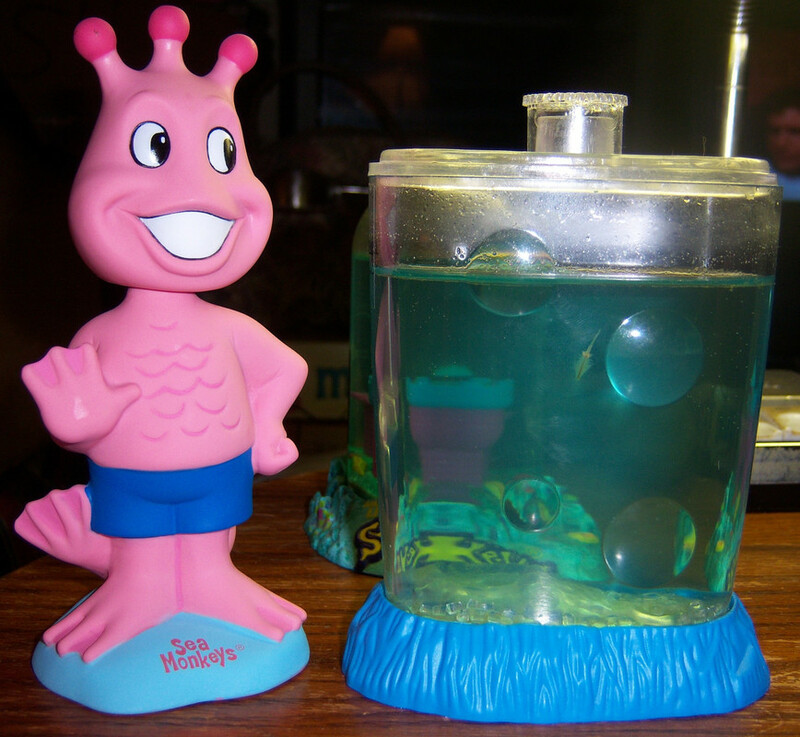 One of the greatest enemies for Sea-Monkeys is carbon dioxide. Carbon dioxide is a gas which all animals naturally produce but is more important to underwater animals than to land animals. In water, some of the carbon dioxide forms a compound called carbonic acid. This is a very weak acid but it is strong enough to kill Brine Shrimp. 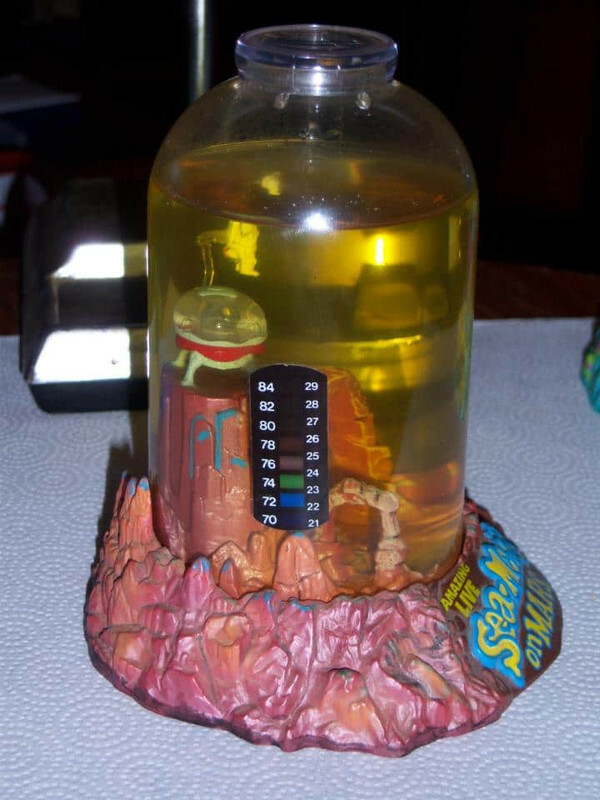 If there is too much carbonic acid present in your tank, Sea-Monkeys cannot make use of the oxygen that is available to them. As a result, they suffocate. So for the best results (and as a precautionary measure), aerate on a daily basis the first week. And if your Sea-Monkeys begin swimming in a sluggish manner, START AERATING again immediately to supply them with oxygen and help fight off the toxic carbonic acid. 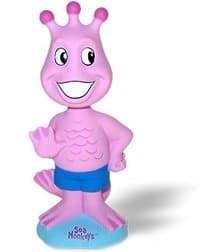 Meet Shakey, he's my new Sea-Monkey Bobble Head. He will be posing with the tanks in todays home tanks update. In oldest Mars experiment the sea-monkeys are still mating. I was able to get a good close up of them. In the old style mars tank the two boys have been joined by some more new borns as a few more eggs must have hatched in last day or so. Esmeralda is rooting around on the bottom this morning, she has a full egg sac, also one young adult and a couple of juveniles are visible swimming about. 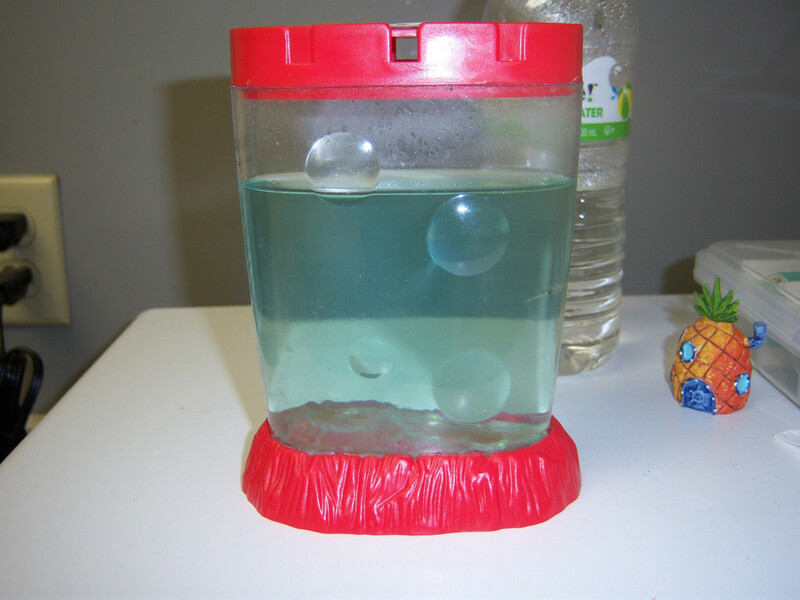 There are several students who stop occasionally to check on the Sea-Monkeys to see how they are progressing. Most people don't like Sea-Monkeys because they can't grow them. They really aren't hard to raise at all. First, you have to prepare the water. Most people mix everything together at once and expect the Sea-Monkeys to be born. Well, you don't get anything but a jar of dirty water if you do that. Here's some tips to keep them alive. 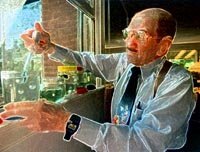 Who was Harold von Braunhut? Who in their Right Mind Could Think of Fish Food as Pets? None other than the guy who invented X-ray Spex! A man by the name of Harold von Braunhut. This man saw a great, instant pet that could teach children around the world the oddities of nature. 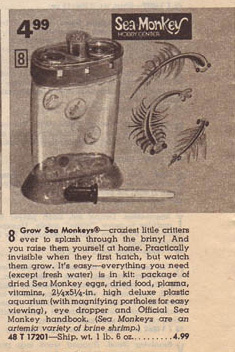 Harold decided to market Sea-Monkeys in 1957. 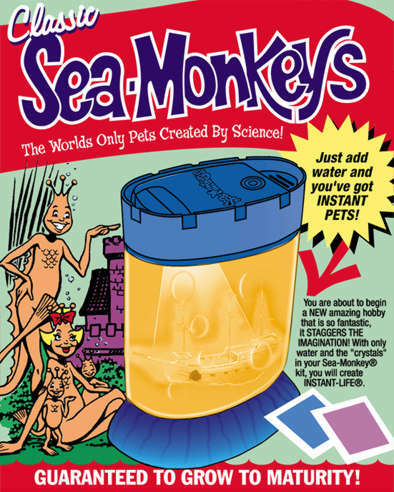 You might well ask the question, 'What is a sea monkey?'. 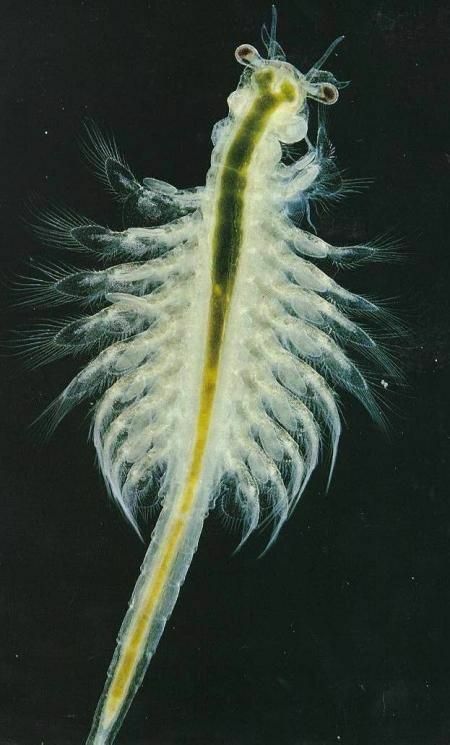 Well, the sea monkey (artemia NYOS) is a relative of the brine shrimp (artemia salina), and looks like a very hairy version of a mosquito larva. These creatures will end up growing to about a quarter of an inch (about 0.6cm) in length.